A few months back, former Vuelta a España winner Luis “Lucho” Herrera revealed that he’d been dealing with skin cancer on his arms, hands, and face for the past six years. The 56-year-old famed Colombian climber shouldered some of the responsibility. “We didn’t take precautions to apply sunblock because there was no time, and sometimes we were sweating a lot,” Herrera said. “The risk is cumulative, so the damage you’re incurring today can show up as cancer decades down the road,” he says. “Like riding itself, you can’t eliminate all your risk, but you can take measures to minimise it.” Here’s what Richburg and other sun safety experts recommend. The main number you’re looking for when choosing sunscreen is the SPF rating. People often mistakenly think these numbers indicate the length of time you can stay in the sun without burning (so if you’d typically burn in 10 minutes with bare skin, you an stay out 15 times longer with SPF 15 on). That’s not really the case. The SPF number refers to the percentage of UVB rays the product filters out. Sunscreens with SPF 15 filter out 93 per cent of UVB radiation; SPF 30 filters out 97 per cent; SPF 50 blocks out 98 per cent, and so forth. For a sun-exposed cyclist, higher is probably better, says Richburg. “It hasn’t been proven that higher numbers will protect against skin cancer better, but if one to two per cent could protect you from even a bit more damage, it’s worth it,” he says. Anyone who’s ever come back from a long ride with streaks of ruby red where they “missed a spot” in their sunscreen application knows it’s not easy to cover yourself completely with lotions. Sprays eliminate the problem by shrouding your skin with a protective mist. Just don’t blast it straight into your face. Apply it to your hands and rub it on, instead. Regardless of the SPF, there is no sunscreen that can last for hours against sweat, says Northwestern Medicine dermatologist Sheryl Hoyer, MD, of Grayslake, Illinois. “A sunscreen can no longer say ‘waterproof.’ It can say ‘water resistant’ if it has passed appropriate FDA testing,” she says. And that resistance doesn’t last terribly long: 80 minutes is about the limit. That means you must reapply if you’re out for several hours. 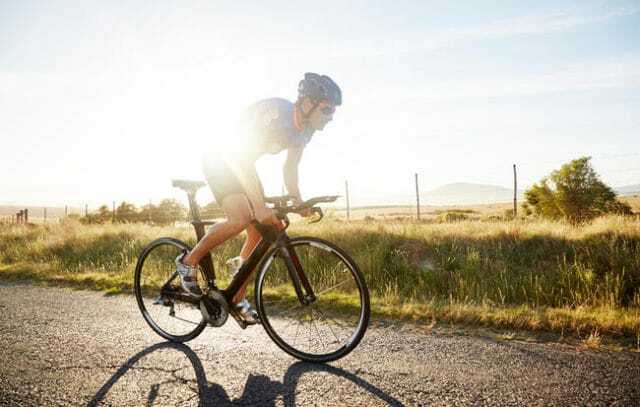 You can’t control the times you race or ride organised events, but you can often control the hours you train, which can help minimise your exposure to the peak sun intensity hours when UV light is strongest, says Richburg. “Plan most of your training hours for the early morning and evening hours when possible,” he says. You wear arm warmers when it’s cold, consider also wearing them during hot, sunny months, says Richburg. These summertime sleeves, like arm coolers, not only have an SPF rating of 50, but also are made with special cooling fabric that incorporates xylitol (the compound found in breath-freshening chewing gum) that reacts with your body heat to turn your sweat into a coolant.